Using interference free DECT 6.0 technology, the versatile PowerTel 601 can act as a phone ring alert or remote answering device for all PowerTel 7phones. Worn on the wrist, users are notified by incoming calls through a vibration of the device. Whether in the home or out in the yard, users will never miss the incoming signal of a phone call. 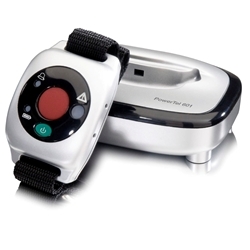 The splash-proof wrist device can even remotely answer calls by activating the speakerphone on the base of PowerTel phone with the touch of a button.